Definition at line 873 of file setupapi.h. Definition at line 874 of file setupapi.h. Referenced by DevInstallW(), DisplayClassInstaller(), EnableDevice(), FindCurrentDriver(), CDeviceNode::GetFlags(), InstallDrvDlgProc(), CDeviceNode::RemoveFlags(), CDeviceNode::SetFlags(), SetupDiGetDriverInstallParamsW(), SetupDiGetSelectedDriverW(), and StartDevice(). Definition at line 881 of file setupapi.h. 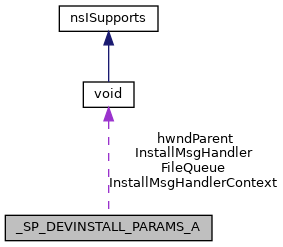 Referenced by SetupDiGetDriverInstallParamsW(), and SetupDiGetSelectedDriverW(). Definition at line 883 of file setupapi.h. Definition at line 880 of file setupapi.h. Definition at line 875 of file setupapi.h. Referenced by DevInstallW(), DisplayClassInstaller(), EnableDevice(), FindCurrentDriver(), CDeviceNode::GetFlags(), InstallDrvDlgProc(), CDeviceNode::RemoveFlags(), CDeviceNode::SetFlags(), and StartDevice(). Definition at line 876 of file setupapi.h. Referenced by FindCurrentDriver(), CDeviceNode::RemoveFlags(), and CDeviceNode::SetFlags(). Definition at line 877 of file setupapi.h. Definition at line 878 of file setupapi.h. Definition at line 879 of file setupapi.h. Definition at line 882 of file setupapi.h.